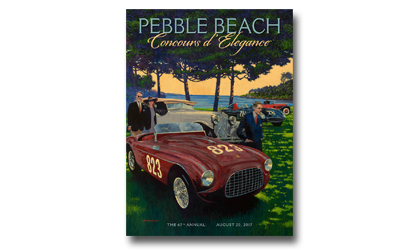 PEBBLE BEACH, Calif. – July 13, 2017– Automotive Fine Arts Society (AFAS) member Barry Rowe, who was commissioned to create the official art for the 2017 Pebble Beach Concours d’Elegance®, has featured the Ferrari 212 Export Touring Barchetta in his masterpiece. His painting will be used for the Concours poster and program cover, while the original piece will be shown in the AFAS exhibit on the greens. Sponsored by The Lincoln Motor Company, the AFAS show will take place on Sunday, August 20. 2017, at the edge of the18th fairway of Pebble Beach Golf Links®. The 1951 Ferrari 212 Export Touring Barchetta illustrated in the art, (chassis 0102 E), will appear on the Concours competition field this year. The car’s first owner, Pietro Palmieri, raced it in the Giro Delle Calabria and the Coppa Adriatica finishing first in class. Bobby Baird, later drove it to another class win at the RAC’s famed Tourist Trophy race in Ireland. Chassis 0102 E was soon traded to Tom Carstens and then to various owners in the U.S. One owner from Carmel, California, Al Crundall, showed it at the 1966 Pebble Beach Concours. A duplicate body was created for it at one point.The current owner, Tom Peck of California, united the original body with its original chassis, both of which were restored to their initial conditions. This Ferrari will be on the field with several other historic competition Ferrari’s. Not far from the Ferrari display, AFAS will hold its annual art show from 9 a.m. to 4:30 p.m. In addition to this Ferrari piece, Rowe will debut several other new paintings. An English native, Rowe studied graphic design at the Coventry School of Art and Design. From there, he worked as an art director in the advertising field before pursuing his passion for painting automotive artwork by becoming a freelance artist in 1966. His career as a painter jump-started when he received the Sotheby’s Art Award for his portrait of World Champion of Drivers, Juan Fangio. This led to commissions from Louis Vuitton of Paris, Royal Mail, Royal Doulton and Royal Caribbean Cruise Lines where his art lines the walls of their cruise ships. As well as his many poster commissions, Rowe has captured ten “Awards of Excellence” and the “Lincoln Award” in 2006 at the annual AFAS exhibit during the Pebble Beach Concours. He has been commissioned 20 times to create pieces of poster art for the Concoursor the related Pebble Beach Tour d’Elegance®. In addition to being an artist, Rowe is an automotive enthusiast. One of his favorite childhood activities was to ride his bicycle to the Jaguar factory and watch “C” and “D-Type” racecars being built. As an avid F1 and vintage racing fan, Rowe travels to famous venues each year. While owning many interesting cars himself, his favorites are a 1931 supercharged Lagonda, a 1929 Riley Nine Tourer and a modern Morgan. He currently resides on the southwest coast of England in Devon County, known for its sandy shores and beautiful coastlines. AFAS was established in 1983 by a group of artists who are acknowledged by critics to be among the best in their field. Members work in many diverse mediums including oil, watercolors, acrylics, wood, gouache, pen & ink, clay and metal. AFAS and its members participate in select shows across the country including the Pebble Beach Concours d´Elegance. Information about AFAS is available at www.autoartgallery.com. For more information contact Scott Black at SBlack@TPRM.com or 214-520-3430.